This page is continually under construction, and provides various bits of information for new and old members of CAIA. The website root directory is located at svn+ssh://username@svn.caia.swin.edu.au/home/svn/infrastructure/caiawww/data/, and updates are pushed to the CAIA webserver every 10 minutes. All new HTML files should have the svn:executable bit set. Failure to set this when adding a HTML file to the repository will cause your commit to fail. It is recommended to use public key authentication when using SVN+SSH. 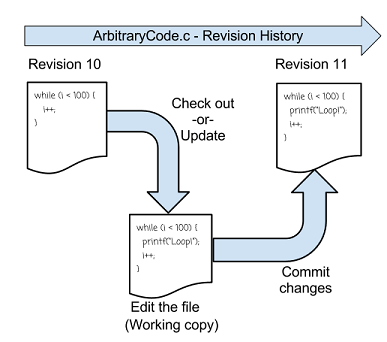 Version Control Systems (VCS) are used to track and control changes to a set of documents in a central location. They allow you to see what changes were made when, by who and when, as well as allowing you to see what the content looked like at any point in time previously. When more than one person is working on a project, a VCS will aid collaboration by making sure everyone gets every update that is made and no one accidentally overwrites someone else's changes. Among other projects, CAIA's website is updated through the use of Subversion, one of the most popular VCS. Every 10 minutes, CAIA's webserver checks for updates to the website from the SVN server. The SVN server hosts a repository. This is where all of the content and its history reside. The repository keeps track of all of the changes, and is where the CAIA webserver fetches its content from. The repository URL is: svn+ssh://username@svn.caia.swin.edu.au/home/svn/infrastructure/caiawww/data/ . This directory is not accessible to normal users, but the content in child directories is accessible to the maintainers of the respective areas of the website. When you download your own copy of the website to work on, this is called checking out. Your SVN client contacts the SVN server, asks for the latest revision of a given directory, and downloads it. This copy of the website that exists on your workstation is called the working copy. You can make any changes you like to this copy without directly affecting the website. Before editing a file, you should always update your working copy. This will contact the SVN server and make sure that you have the latest copy of the files you are working on. If someone else has edited the files since the last time you worked on them, it will ensure that your working copy reflects this. If you have edited your files since the last time someone else edited them and you didn't update beforehand, your SVN client will attempt to merge both changes in to the file. If you edit a file and decide that you don't like the changes you have made, you can tell your SVN client to revert your changes. This process will revert your file back to the latest revision. You can also use the revert process to turn back the clock and make your working copy reflect the state of the website at an arbitrary point in the past. Once you have edited your files and are happy with the changes, you must commit your changes. Committing your changes pushes them to the SVN server, where it becomes part of the latest revision of the repository. Most of the pages that are a part of the CAIA website use Server Side Includes (SSIs), a very basic scripting language used to include files and execute other scripts. If you open one of your own HTML files in a browser, you will see that there is no Swinburne theme - this is because your browser does not know what to do with the SSI directives. The webserver on Mordor is SSI enabled. Mounting your Mordor home directory, then keeping your working copy in a folder under ~/public_html/ allows you to see the pages as they would appear on the CAIA webserver. Because the website uses Server Side Includes, each HTML file needs to be marked as executable. To make any HTML files you add executable, you need to modify your configuration file. In windows, %appdata%\subversion\config and in FreeBSD/Linux, ~/.subversion/config. Failure to do this will cause an error message to appear when you attempt to commit a new HTML file. Because we use SVN+SSH://, we can use public key authentication for the SSH portion of the connection. This means that we do not have to enter a password every time we perform an action with the SVN server. It is not necessary to use public key authentication, but it is a convenience for people who regularly update the website. The preferred Windows SVN client is TortoiseSVN. 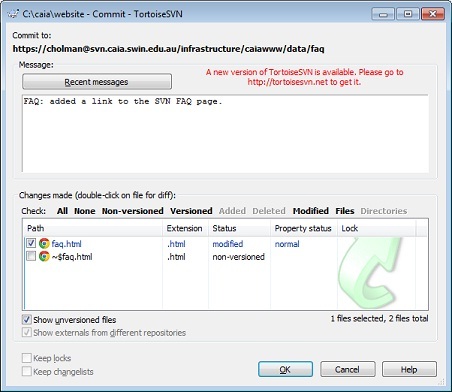 TortoiseSVN integrates with the right click menu in Windows Explorer, and provides a fairly intuitive interface to SVN. Right click on the folder and select "SVN Checkout..."
Your working copy is now up to date and in the folder you selected. Right click on the folder containing your working copy and select "SVN Update"
Your working copy is now up to date, and you are free to edit your files as you see fit. Once you have finished editing and are ready to submit your changes, you must commit your changes. EG, "Added new seminar to list" or "Fixed a typo on the L3DGEWorld page"
Within the next 10 minutes, your changes should appear on the CAIA webserver. If you are unhappy with changes you have made, you can revert back to a previous revision from the SVN server. A similar method can be used to roll back your working copy to a previous revision. On the box that appears, select "Show log"
On the next box that appears, use the list of revisions and their descriptions to find the revision you wish to roll back to (newest is at the top). Select the revision. If you wish to roll back what appears on the CAIA website to a previous revision, follow the steps above to roll back your working copy, then follow the steps to commit your working copy. On Windows, this is achieved through using PuTTYgen to create a public key pair, and the Pagaent daemon keeping the key in memory. Download and install PuTTY and related tools. All programs will be installed under the 'PuTTY' group in your start menu. Run smbpasswd. Enter your password, then exit PuTTY. Open PuTTYgen. Select "Generate" to create a new key pair. Move your mouse randomly to increase the randomness of the generated key. Run this command, replacing username with your username: cat ~/id_rsa.pub | ssh username@svn.caia.swin.edu.au "mkdir -p ~/.ssh && tee >> .ssh/authorized_keys"
Open Pagaent (installed with PuTTY), and right click the icon in the system tray (It looks like a PC wearing a hat). Select "Add key". Open the .ppk file you saved in the previous step. If you used a passphrase to protect your private key, you will need to enter it here. You can now use the SVN+SSH method without having to type your password every time. The recommended SVN client for FreeBSD/Linux is Subversion. It is a simple to use CLI tool and is available in both FreeBSD's ports and binary package system and the package manager on your favourite Linux distribution. Edit the files as needed using your favourite editor. svn commit -m "Brief comment describing what you changed"
if you do not wish to revert the entire directory. cat ~/.ssh/id_rsa.pub | ssh username@svn.caia.swin.edu.au "mkdir -p ~/.ssh && tee >> .ssh/authorized_keys"